They’re back with a new catchy single. It’s been ten years now since Lonestar was in the top ten on the country singles chart. That’s kind of crazy for a guy like me because these guys were the biggest band in country music while I was growing up. They kind of went through a change in country music and got better. Things were pretty traditional in the ’90s and Lonestar had two big albums with lots of hits. Then as the ’00s turned things got a little more pop in the country world and Lonestar had even bigger hit songs. They haven’t really stopped since that last hit in 2006 although lead singer Richie McDonald left for a few years, but they’re back now with new music. Here is the latest single. This sounds like a classic Lonestar song. It’s catchy. It’s upbeat. You feel better after listening to the song. I have always liked that about Lonestar. They have such a unique sound and I think they’re still sounding great even after all these years. I don’t know if this one will get radio play. The odds are probably against it, but you never know. The cool thing about music today is that people can discover a song like this one on YouTube or on Spotify or it could get played on The Highway and you udon’t know what could happen after that. 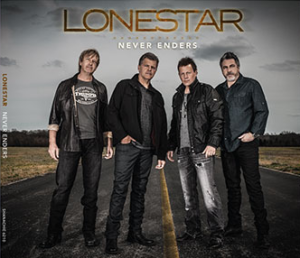 Lonestar is one of my favorite bands. I love all their old hits and this new song is good too. It’s hopeful. They’re not giving up and they’re here to make their mark. What do you think of this new one?